I quit my job end of April and as a result I am officially ‘werkeloos’: unemployed. You may also encounter ‘werkloos’ which means the same thing. I think ‘werkeloos’ is more common in daily speech. Note that the latter can also mean ‘without action / not operating’. In DWOTD Voetstuk I covered the song ‘Over de Muur’ by the 80s band ‘Klein Orkest’. They also had a song about being unemployed which we will cover below. In the song ‘Koos Werkeloos‘ the character ‘Koos Werkeloos’ sings about being unemployed and that he is actually quite happy with the situation. Dutch people who are old enough may refer to this song by calling somebody who is unemployed ‘Koos Werkeloos’. The lyrics have some interesting Dutch expressions to take note of. En Koos gaat ook geen vakken vullen, zeker om de zak te vullen van de fabrikant! Al dat gezeur van ‘ga toch werken Koos’, Koos Werkeloos! Kijk hè, je hoort vaak zeggen, waar moet dat heen? 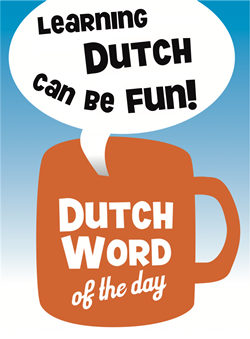 This entry was posted in Dutch songs, Dutch word of the day, DWOTD 1.0, Vocabulary Basic and tagged baan, baanloos, Klein Orkest, koos werkeloos, minima, werkeloos, werkloos by Sander. Bookmark the permalink. I do have to be somewhat of a “precise Pete” but there is a real difference between werkeloos and werkloos. The first refers to not being working as action while the latter means you are out of a job. With werkeloos you could actually have a job but not be doing something about something: hij staat er werkeloos bij te kijken. Werkloos is just plain and simple jobless. We have a similar expression in English to “(zijn) zakken vullen”. It’s “to line one’s pockets”. Hi Julian – thanks for this, I’ll update the post!! This one was interesting, good to see DWOTD updated again, was afraid you had disappeared recently Sander :)! Will be needing this page more than ever in the next few weeks… moving to Utrecht in 3 weeks, thankfully armed with a repertoire of funny expressions from here, haha. Hey Liam – good luck with the ‘verhuizing’. Utrecht is a nice town, I went to university there; I’m sure you will have a good time!